InDesign - Can I “float” an anchored frame to the top of a column? It is very, very common in textbooks and publications of that ilk to locate a figure (or even two) at the top of the page that contains the figure reference text (e.g., “See Figure 39.2”). 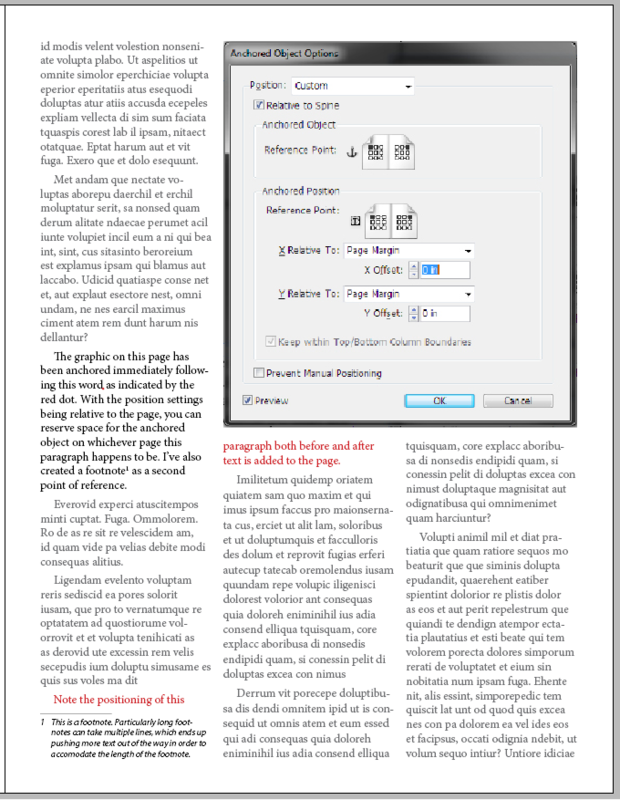 If layout is such that the figure and its reference do not fit on the same page, the figure “floats” to a following page (the closer the better). I seek such behaviour in InDesign. In FrameMaker (r.i.p. on Mac), there is a Position setting “Top of Column” available for an anchored frame that causes the frame to locate itself at the top of the text frame containing the anchor (or, if the “Float” setting is checked, on the first available autoconnected text frame, possibly on a subsequent page). I can write a whole chapter with dozens of illustrations, and Frame will place figures at the tops of pages and will displace text accordingly, with no manual layout intervention. Arbitrary amounts of material can be inserted in front of a figure, with no need for manual adjustment of column heights or positions or manual rearrangement of anchor positions in text. Admittedly, a little bit of fine tuning is sometimes called for upon finalization of layout, but all in all, it works like a dream. The majority of today’s textbooks use such a layout style, and the majority of today’s textbooks are laid out in InDesign. I have searched and searched, so far without success, for a comparable feature (or a set of hacks to mimic the feature). I have been able to position a graphic frame at the top of a column by locating its anchor near the bottom of the previous page. (I set text wrap around the figure frame’s bounding box.) Apparently though only text AFTER the anchor “wraps” (runs around) to avoid the graphic frame; that characteristic of text wrap seems to preclude my placing the anchor adjacent to the figure reference. Also, as I delete material ahead of the anchor, the figure moves up and up and up into the top margin of its page. It’s a mess. Is there an InDesign facility (or hack) comparable to this Frame feature? Follow-up: Is there a mechanism in InDesign to put a table at the top of a column? You'll be wanting to use Custom Positioning of inlined Anchored Objects. First you need to anchor the object to some point in a text frame (a text frame that likely contains the relevant text). Do this by copying the graphic element (or figure, or table or another text frame... anything) and then place your cursor in the text box it relates to and paste the object. The cursor position at the time of pasting will be the anchor point, and can be seen by turning on hidden characters (Type > Show Hidden Characters), but is otherwise invisible. Then, using the selection tool, select the Anchored Object, and then right-click it and choose Anchored Object > Options. From the window that comes up, you'll want to change the Position pull-down at the top to Custom, and then play around with the Anchored Object Reference Point and Anchored Position settings to align whichever edge of your anchored object relative to a reference point on your text frame, column edge, page edge, etc. - it's up to you. In my testing, I've only been able to get text-wrap settings that have been applied to the anchored object to affect text beginning with the line below the line containing the anchor point (that little Y symbol visible with the show hidden characters turned on). For this reason, it's probably best to make the anchor point as early in the text as relevant, and possibly to even specify a bottom-of-page or column type of positioning rather than top-of. I'm using InDesign CS6, but I believe these positioning options have been around since at least CS3, but that is just based on memory, which isn't very reliable. In this example, the graphic looks like a dialogue box, but it is actually an anchored graphic. I used a screenshot of the dialogue box so that you could see the settings I used to accomplish this. The only other setting applied to the object is Text Wrap. You can see that even after making edits to the page, the text has all shifted, but the space is still reserved for the Anchored Object. This object could be an image, an illustration, a text frame, or any other object. The anchored object can be anywhere on the page, it does not have to be within the bounds of the text frame. Having an Anchored Object be positioned above or before the anchor point. This is particularly a problem on when trying to position an object relative to the left side of a page, or when trying to position the object at the top of a column. Having multiple Anchored Objects on a single page. In these cases, I think they must be positioned intentionally to avoid overlapping each other, and that can produce undesired results when edits affect pagination. Not the answer you're looking for? Browse other questions tagged adobe-indesign or ask your own question. 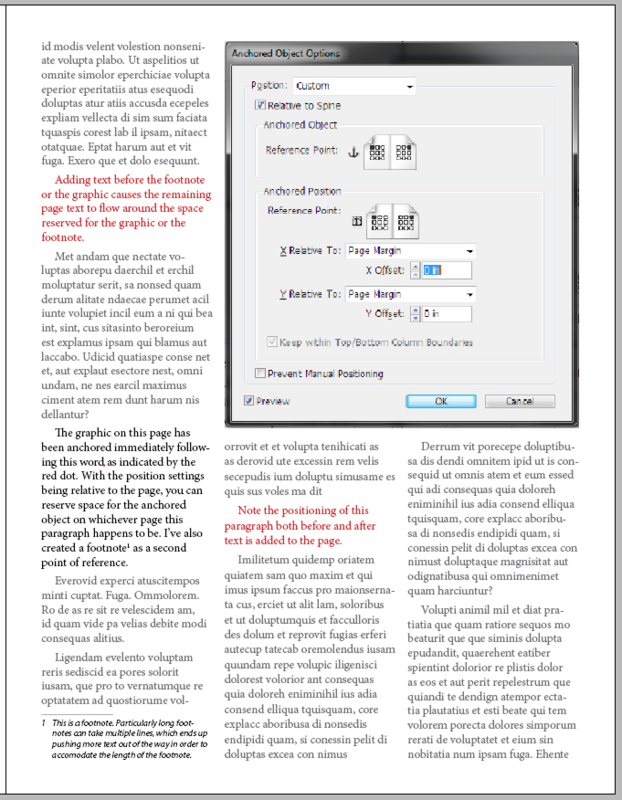 InDesign: how can I fix pagination so linked text threads are in order again? How to get previous paragraph text to wrap around an anchored object?